Mitsubishi has made numerous CRT projectors over time, the most popular (but still fairly rare in the used market) of which is the 1281. The Mitsubishi 1281 CRT projector is a very capable projector with 7" EM focusing tubes for a sharp picture. The tubes are liquid-coupled (Mitsubishi calls this 'Optically Coupled') for greater contrast ratio than air-coupled projectors. The lenses are proprietary and colour filtered for more correct colours. 900 lumens of light output in a fairly small package. Video, S-video, and RGB inputs. The biggest downside to this projector is its rarity. The projector itself (and therefore parts for it) are nearly impossible to find and getting help from others is practically impossible as nobody else owns one. Keep that in mind when looking at purchasing this projector. Note: When assessing tube wear on this projector, it's best to remove the tubes completely as the lenses have a dichroic coating that is nearly impossible to see through. To see how these projectors rank in relation to other projectors for use in a home theater environment see the Projector Rankings page. 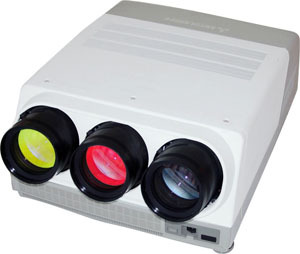 For full specifications on these and other projectors, see the Projector Specifications page. For an overview and history of Mitsubishi see the CRT Primer.